Watch video of the entire event here! Read the full article, “States Raising Age for Adult Prosecution Back to 18”, published by the ABA Journal on February 1, 2017. CLBB Co-Director and Co-Founder Dr. Judith Edersheim is interviewed in-depth to comment on what neuroimaging can and cannot reveal about the “criminal brain”. CAN BRAIN SCIENCE predict when someone will commit a crime, or tell whether a defendant knew right from wrong? In recent decades, scientists and criminal justice experts have been trying to answer tantalizing questions like these — with mixed success. As the American population ages, the medical and legal systems will have to balance concerns about protecting the elderly from fraud and victimization with fundamental autonomy rights. In this event, the Center for Law, Brain & Behavior will present a case that concerns a tragic trajectory caused by undetected brain disease and discuss both missed opportunities to intervene and the implications for legal and social policy. 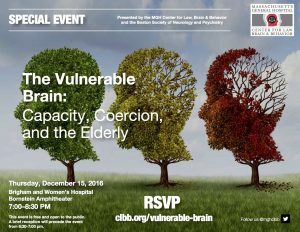 Weaving a narrative that highlights the subject’s personal life and neurological decline, experts in psychiatry, law, and neurology will consider: what can be done to protect the vulnerable, aging brain? Examining everything from forensic reports, to medical records, to a literal brain, CLBB Co-Director Dr. Judith Edersheim and CLBB Faculty Member Dr. Brad Dickerson (of Massachusetts General Hospital and Harvard Medical School) will tell a story that exemplifies how vulnerable an ailing, elderly person can be. CLBB Co-Director Dr. Bruce Price will join as a discussant during the Q&A session with the audience. This event will be held on Thursday, December 15, 2016, at the Brigham and Women’s Hospital, Bornstein Amphitheater, from 7:00-8:30 pm.